NICHE: There are so many literary journals out there, including my own, that publish fiction, poetry and literary nonfiction. So many, in fact, that people are often dismayed when yet another literary magazine is founded without any clear purpose. One thing that drew my attention is to your magazine, however, is its very distinct mission statement and intent Can you tell our readers a little bit about how the idea for Iron City Magazine came about? NATALIE VOLIN: The other co-founder, Cornelia “Corri” Wells and I first met when she was my English 102 professor at Arizona State University. The next semester, she roped me into being an intern for the Pen Project, a distance learning program that connects inmate writers with students who critique and respond to their work. I responded to some really quality writing by authors who expressed an interest in publication. Corri and I discussed what options these incarcerated writers had for that, and ultimately found that the opportunities were extremely limited. Most journals won’t take mail-in submissions anymore, and certainly not hand-written submissions. On top of that, the prison system puts up an array of restrictions. So, there’s a whole population of talented writers and artists who can’t publish their work. For a long time Corri and I bounced around ideas until we decided that we would make a journal that caters to this population and their challenges. NICHE: Your website states that Iron City Magazine intends to publish both in print and online. What type of content will readers expect to read in print? What kind of content will they expect to read online? NATALIE VOLIN: Our print magazine contains poetry, nonfiction, fiction, and art. We knew that at the very least we had to publish in print because the majority of our contributors wouldn’t have access to the internet. While this costs us more to produce, how could we justify creating a magazine that the contributors couldn’t access? We also published the magazine as PDF online for those who do have internet access. Additionally, we have a section on our website called Iron Filings. This is a blog where we publish essays that are less literary, but still important for continuing conversations about prison-related topics. So far we’ve featured four prison educators and one incarcerated writer. NICHE: Iron City Magazine accepts fiction, poetry, artwork (of any medium), and creative nonfiction. There’s a fair amount of discussion regarding how to define ‘creative non-fiction.” Some argue that a work can be labeled as creative nonfiction if the content is emotionally honest. Others believe creative non-fiction must be emotionally driven but also factual correct. I noticed that your creative nonfiction guidelines state that the pieces should be ‘based in fact.’ I’m curious as to how Iron City Magazine will be defining creative nonfiction. NATALIE VOLIN: It’s important to us that our creative nonfiction be based in fact for a couple reasons. First, because we want to honor the people who trust us with their stories. Incarceration—whether one’s own or that of a loved one—holds a weighty stigma. Writing about it and sharing it with the world takes courage, and we want to make sure that everyone’s story is met with validation and respect. Second, because part of our goal is to open a window into the prison world and shine a light on what it means to be affected by incarceration. The best way to combat the stigma surrounding incarceration is to highlight inmates’ humanity. A true story achieves this wonderfully. NATALIE VOLIN: We are attracted to pieces that are not only honest, but artfully so. Especially working with the incarcerated population, we expect that there might be some ugly truths that come out. When these truths are artfully and deliberately crafted, though, they can become beautiful art. NICHE: What can you tell us about the first issue? NATALIE VOLIN: This first issue has 31 contributors, 22 of whom are currently incarcerated. The rest are formerly incarcerated, prison educators, and family members of incarcerated individuals. Some pieces reveal the author’s situation through the writing itself, but we intentionally made no further effort to identify who is and isn’t incarcerated. The more I think about it, the more amazed I am that over two-thirds of our contributors are currently incarcerated. It’s amazing because they heard about us through their teachers and family members and peers. It was all word of mouth, since it’s not like inmates can Google “prison lit mags.” It especially means a lot that so many incarcerated writers submitted work because if you’re only making 50 cents an hour, paying for a stamp and an envelope is a big deal. NICHE: Iron City Magazine recently extended its deadline to January 31. 2015. When will the inaugural issue be released? How many times of year will Iron City Magazine be released? NATALIE VOLIN: We released the inaugural issue in March, which was a huge accomplishment for us. It took 18 months from when we first started toying around with the idea of making a magazine to when we held physical copies in our hands. Now that we’ve got our feet on the ground, it won’t take us nearly that long to get to the second issue! We’ve set the submission deadline for July 31, 2016. Our goal is to put out two print issues per year. We will be reading all year, however, and publishing select content to the Iron Filings page. 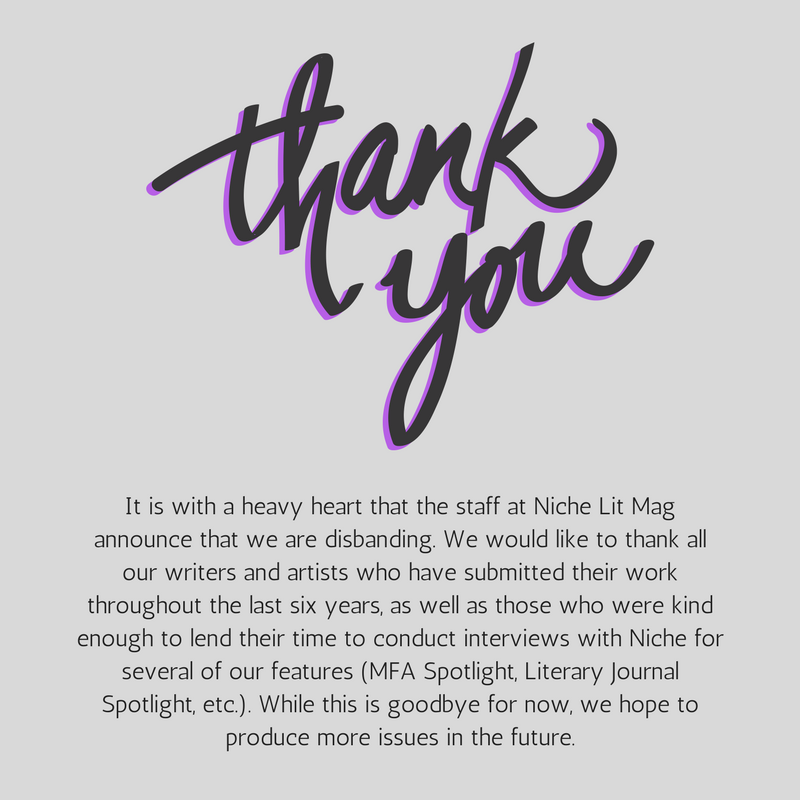 NICHE: Do you have any advice for those who wish to submit to your magazine? NATALIE VOLIN: We love un-sugared honesty. We love surprises. We love a mix of perspectives; we want to hear from inmates, from prison educators, from prison staff, from family members. If you’ve been touched by incarceration, we want to hear your story. This interview was originally published on Niche’s website on April 26th, 2016.